Authentic Cuban Son and Salsa band for hire. Yambu play authentic Cuban son - the essential Afro-Cuban sound that originated in the streets of eastern Cuba and gave rise to modern salsa. This music is an intoxicating fusion of Spanish and African rhythms, and Son Yambu give it a contemporary edge that's perfect for festivals, corporate events, weddings, parties and private functions. Yambu play authentic Cuban son – the essential Afro-Cuban sound that originated in the streets of eastern Cuba and gave rise to modern salsa. This music is an intoxicating fusion of Spanish and African rhythms, and Son Yambu give it a contemporary edge that’s perfect for festivals, corporate events, weddings, parties and private functions. The band members, who all have a lifetime’s experience playing Latin music, both as recording artists and in live performances at venues around the world, mainly come from Santiago De Cuba (the birthplace of son) and, are all passionate about maintaining the traditions of the genre. On vocals, and minor percussion, Yuri is a true superstar, having performed with the likes of Cachaito of the Buena Vista Social Club. She is a born entertainer, and aficionados have likened her to a young Celia Cruz. Also on vocals and percussion, Cuban Kiko have played all over the world and is considered one of the finest male Cuban singers in Europe. The brilliant Manuel Alejandro Tellez on trés and backing vocals is another high-class performer. Yambu’s rhythm section boasts the extraordinary talents of Reynaldo Crespo on Guitar, Oscar Vazquez Romero on bass, and Raudelis ‘Piqui’ Cisnero on congas and Toby Herschmann on timbales. They’re the force that drives the music along. And soaring above it all, there’s the trumpet of virtuoso Victor Hechevarria who has toured world wide with several renowned Cuban bands and is an ex-member of the Santiago Symphony Orchestra. The band has a flexible line-up that can be tailored to match the occasion. 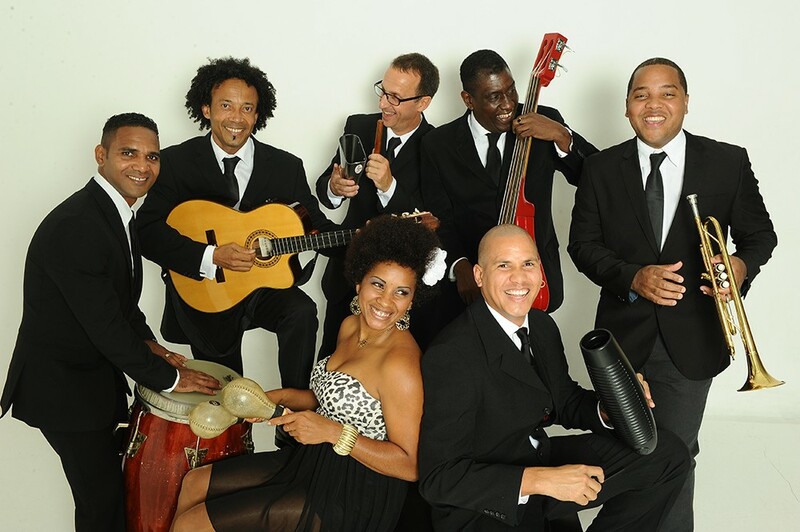 Playing as a traditional Cuban septeto, the band performs with 7 musicians – lead vocalist, trés (Cuban mandolin), guitar, bass, trumpet and two percussionists. For smaller events the band can reduce in size and play acoustically, and for larger events, with additional brass and percussion, the band can play as a 10-piece.